The Fishtank is sending audiences outside to play! Fishtank Curator Heidi Van and collaborator Ingrid Andrea Guertsen team up for “53 Days & 52 Nights”, an epic and cinematic clown story in the Fishtank’s storefront window, giving Kansas City audience a truly unique “theater al fresco” experience. Featuring Heidi Van, Ingrid Andrea Guersten & Coleman Crenshaw, with live musical accompaniment by Fishtank Resident Peter Lawless and Daniel Eichenbaum. Directed by Fishtank Resident Damian Torres-Botello, produced by HYBRID: A Theatre Collective. 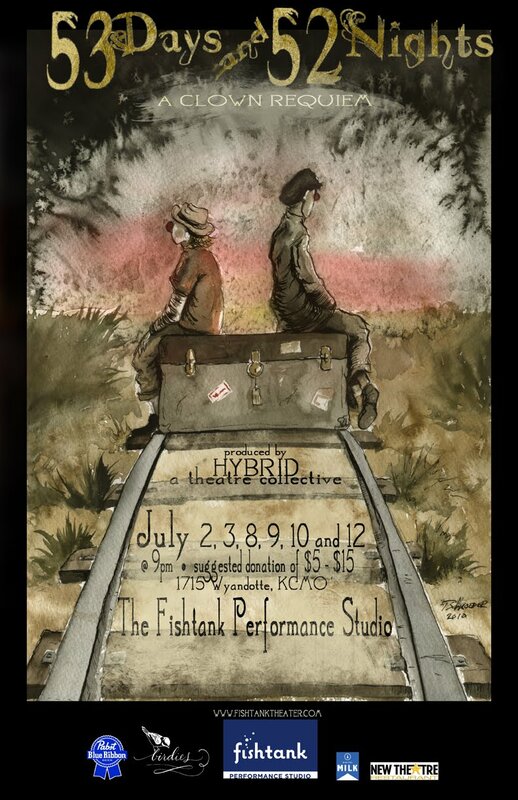 Running July 2, 3, 8, 9, 10 & 12 at 9pm in the windows** of the Fishtank Perfomance Studio. Donations accepted at the door $5-15. **All window performances are 30 – 35 minutes in legnth. Support this show by pledging to our fund drive and receive VIP seats. This production is generously sponsored by Pabst Blue Ribbon, the New Theatre Restaurant, Birdies, the Fishtank Performance Studio and Digital Milk. Digital Milk is a Kansas City based creative media collective providing our clients with unique, effective solutions to make noise in this competitive market. Defined by its trilogy of talent Digital Milk provides a full service audio and video production suite as well as in house motion graphics and design…. This allows us to create HD video and animation to use in social media, viral campaigns, web and television spots. Digital Milk services include: audio, video and graphic production, original music composition, creative services, corporate branding and identity campaigns, photography services, 3D imaging (CGI) and much more.